If you have any unexplained pain, change in bowel habit or have black/tarry stools you need to consult your medical practitioner immediately. Lack of exercise has been implicated as a risk factor in developing gallstones. Coffee may trigger an attack if you have gallstones. This is because it increases levels of CCK, a hormone that causes the gallbladder to contract. Fasting for more than 14 hours (eg. not eating breakfast) could increase the risk of trouble from gallstones1. People with gallstones tend to have fewer or harder bowel movements (ie less often than every 24 hours). That means it takes 48 hours from eating the food to its waste products being eliminated in the stool. Test your transit time by sitting down to a meal containing a large cupful of sweetcorn or beetroot. Time how long it takes for the visible sweetcorn particles or red stool (the beetroot) to start appearing in your stool and how long it takes for the last of it to finish appearing. If you stool transit time is more than 24 hours you are constipated. Do you eat a low fibre diet? Low fibre intake is associated with an increased risk. A diet that is naturally high in fibre from a variety of sources reduces your risk of getting gallstones and also lowers the chance of developing more if you have them already. Diets that contain low levels of saturated fat (animal fat) and very few refined vegetable oils are best. However this diet does need to contain enough of the healthy “essential fats” your body needs for gallbladder function and overall health. Unexpectedly, extremely low-fat and very low calorie diets could increase the risk of developing gallstones. Do you eat a high GI diet? A high GI diet is associated with greater risk of developing gallstones. Are you eating too many refined carbohydrates? Could you have low stomach acid? The stomach makes acid in order to break down the foods you eat to more maneagable fragments. When you eat a meal your chewed food mixes with acid in the stomach. When this mix leaves the stomach and enters the small intestine its acidity triggers the gallbladder to contract. This contraction pumps out bile, bile salts and pancreatic enzymes that continue the digestion of proteins, carbohydrates and fats. This also clears the gallbladder of wasteproducts coming from the liver. 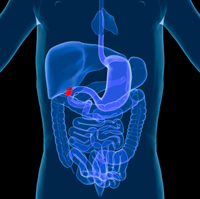 In a study published in the Lancet, 50% of people with gallstones had inadequate levels of stomach acidity2. Gallstones can sometimes be caused by coeliac disease. This is because some of the gut hormones that trigger your gallbladder to pump are made in the villi in the small intestine. In coeliac disease these villi are damaged or destroyed and so cant make the hormones that instruct the gallbladder to contract and release its contents. See the coeliac section of this website for further information.